Men with conscience developed goose pimple when even the ELITES started doing BARBARIC POLITICS ,for days now ,Dr Christopher Ngige has been sending his agents and goons to scout for NEWSPAPERS that will publish the pictures of those innocent people that died in UKE STAMPEDE. They will buy a space for advert and in-place bring stories and pictures of calumny ,but Newspapers with class refused to accept such absurdity ,they simply refund them the money ,but the only papers that will report them are the ones owned by TINUBU like NATIONS and THE BRIDGE owned by BUHARI and operated by CHRIS NGIGE. Good a thing Sir Victor Umeh on his speech at AGULU LAKE BRIDGE FLAG OFF yesterday ,in the presence of many Traditional Rulers swore that if his hand or that of his Party or that of Governor Peter Obi is in that stampede ,or if they had conspired ,considered or manipulated the STAMPEDE ,may the God in heaven and gods of the land wipe away his generation and he also said that if they are innocent ,and people are brandishing their name just to gain political advantage ,may the wrath of the gods descend on them. He said if that STAMPEDE were in any way designed or plotted by anybody or Political Party ,may the gods of the LAND and God in heaven wipe away the generation of that people and the people shouted AMEN. 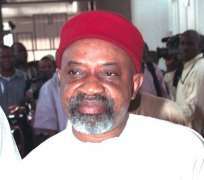 Somebody should tell Ngige that what he started in 2003 at Okija shrine may be one of things that is militating against him and he should repent and seek the face of God.